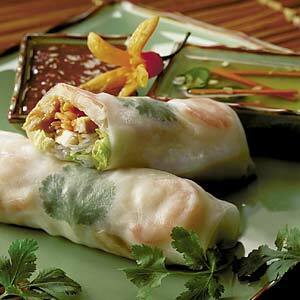 Our Thai Peanut Sauce is not so traditional, but it's perfect for appetizers like spring rolls. This easy-to-make peanut sauce is thick, clingy, and a little sweet, with a kick at the end. Combine all ingredients in a saucepan and bring to a boil. Reduce heat and simmer sauce for 2 minutes. Remove sauce from heat and cool to room temperature. Serve cool or keep refrigerated until ready to use.